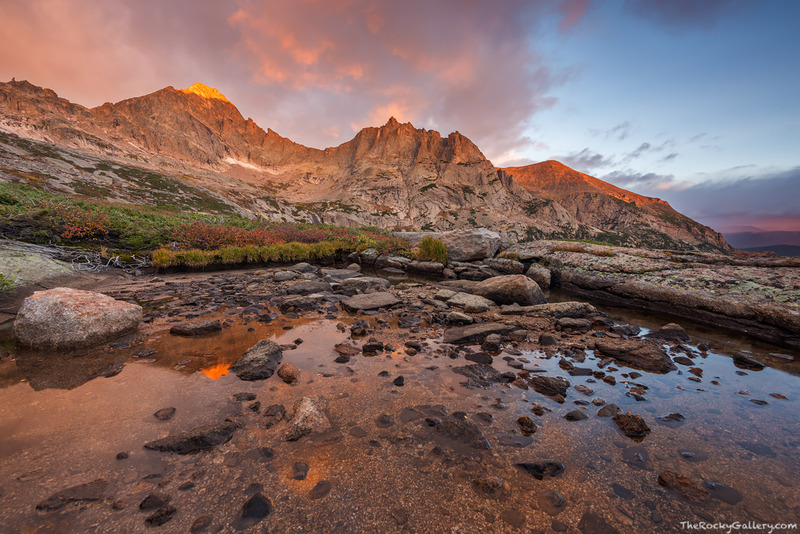 A dynamic morning unfolds on the alpine tundra above Black Lake deep within Glacier Gorge. It's a long difficult hike to reach the country above Black Lake and near Green Lake but it contains some of Rocky Mountain National Park's most beautiful terrain. Nestled on the backside of 14,259 ft Longs Peak, the alpine tundra has impressive view of McHenry's Peak and The Arrowhead. Rain was falling this morning and rainbows could be seen down in the valley. For a few short moments McHenry and The Arrowhead were bathed with sunlight. Photo © copyright by Thomas Mangan.